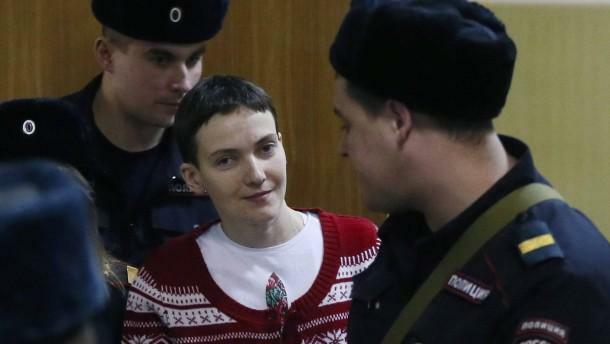 Nadiya Savchenko at February 10, 2015 Basmanny Court appearance in Moscow, on her 60th day of hunger strike. “My sincere thanks to the President of Ukraine and the Ukrainian delegation, who took part in the sixteen-hour-long round of negotiations in Minsk. I thank you from the bottom of my heart for your endurance, fortitude, and loyalty to Ukrainian values and Ukraine’s position. I understand that it was a titanic effort on your behalf. Last night, I stayed awake, as you did, awaiting the results of the negotiations. I also thank you for giving me hope at the beginning of the end of my imprisonment in this prison of nations where I am being held right now. I am looking forward to meeting you soon, in our Ukrainian homeland, and hope to shake your stalwart hands. VoU: Nadiya Savchenko appeared in Moscow’s Basmanny District Court on February 10, 2015, where her detention was extended until May. You can watch her speech and statement in court here. 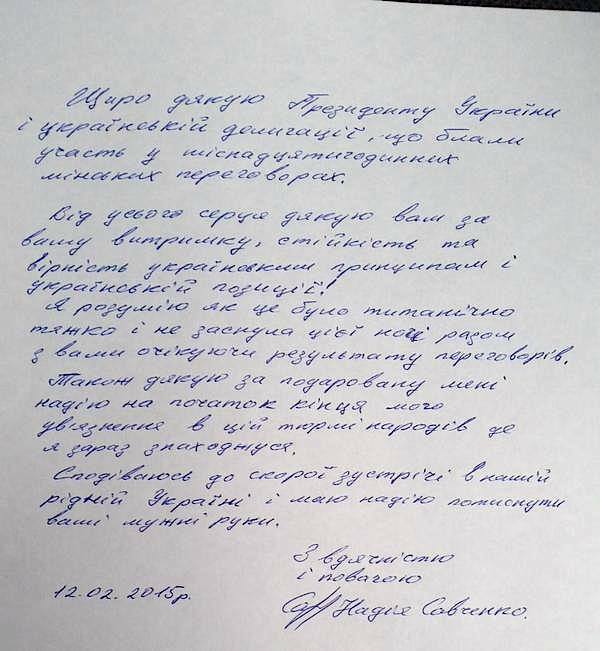 This entry was posted in #Free Savchenko, English, English News, Letters, Pictures, War in Donbas and tagged #FreeSavchenko, #Human_Rights, #Nadiya Savchenko, #RussiaInvadedUkraine, #SaveUkraine, #StopRussianAggression, #UkraineUnderAttack, Russia, Ukraine, warinDonbas. Bookmark the permalink. Nadiya has a beautiful script. Bring her home! We need her alive. Петр Порошенко, как Верховный Главнокомандующий, должен немедленно ПРИКАЗАТЬ Надежде прекратить голодовку! Ибо никаких гарантий ее освобождения нет, как и не было! Її адвокат повідомив їй, що він проситиме президента, щоб замовити її зупинити протест, і вона сказала що вона і так буде продовжувати голодування.